Takahashi, C. (2015). L2 motivation and young self-instructed learners’ persistence in learning English: A causal analysis. Studies in Self-Access Learning Journal, 6(4), 365-381. 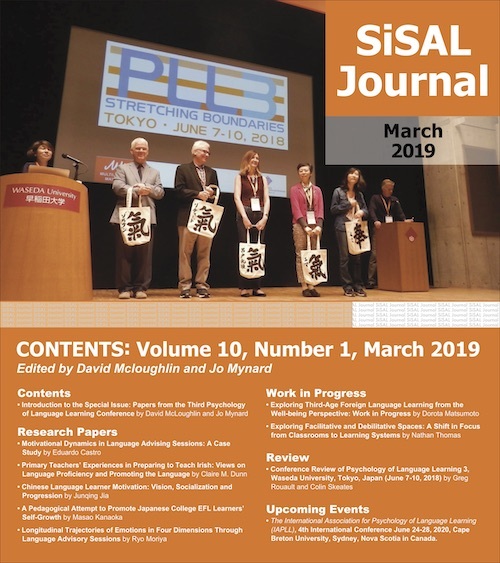 This study examined the structural relationships among factors affecting self-instructed learners’ persistence in learning with a sample of Japanese high school English learners. L2 self-instruction remains under-researched, in spite of the importance of out-of-class learning emphasized in the literature. One example of L2 self-instruction that is prevalent in Japan is learning using self-instructional radio (SIR) materials, with the country’s public broadcasting company offering radio English-education materials since 1934. Self-instructed learners find it difficult to persist in this type of learning and the drop-out rates have been reported to be high. In order to investigate self-instructed learners’ motivational bases and their relationships to persistence, a questionnaire was administered and two models were tested using structural equation modeling. The results indicated that the intensity of motivation and the quality of learning experiences with these materials were related to persistence in learning. Furthermore, simply persisting in learning using SIR materials did not make learners confident in L2 communication. Practice in L2 communication might be necessary in order for learners to become more confident in L2 communication, which SIR materials did not offer. Despite being in the era of globalization and English as the primary international language contact with the target language is still limited in many English as a foreign language (EFL) contexts, both inside and outside the classroom. Under such circumstances second/foreign language (hereafter L2) learners do not have enough opportunity for input, output, or interaction. One way of compensating for such shortcomings and immersing oneself to the target language is L2 self-instruction, which takes place outside the regular classroom without institutional control. L2 self-instruction, particularly using broadcast materials, has been prevalent in certain contexts such as Japan. It has been perceived by L2 learners to be an economical way of learning with relatively easy access and rich input. However, many learners find it difficult to persist in this type of learning possibly because there is no mandatory attendance or assessment of their learning. One factor that might be closely related to self-instructed learners’ persistence in learning is L2 motivation. Although much has been investigated in the field of L2 motivation (e.g., Gardner, 1985; Yashima, 2002), L2 motivation among independent learners has not been investigated enough. This study aims to investigate the motivational bases among L2 learners in self-instruction using radio materials and their relationships to persistence in learning. In doing so, two models are tested by using structural equation modeling (SEM). L2 self-instruction using broadcast materials has been a prevalent way for learners, including young learners such as junior high and high school students, in some contexts. For example, the Japanese public broadcasting company Nippon Hoso Kyokai (NHK) has been broadcasting radio English-education materials since 1934 and TV English-education materials since 1953. One of the problems L2 learners face in self-instruction is the issue of motivation. L2 learners in self-instruction need to keep motivating themselves without encouragement/pressure from their teachers/peers, and many find it difficult to persist in learning. In spite of such difficulty some learners seem to be able to persist for a long time, for years in some cases. The question arises, then, as to the differences in the motivational bases between persistent and non-persistent learners. There have been developments with regard to the conceptualization of L2 motivation after the dominance of the socio-educational model (Gardner, 1985). Researchers have tried to propose models that may be compatible with English as an international language used by L2 learners without a clear target-language community in their mind. First, in the Japanese EFL context Yashima (2002, 2009) proposed the attitudinal construct of international posture (IP). It tries to capture one’s readiness to interact with people around the world in English, and is made up of the following four sub-constructs: (a) intergroup approach-avoidance tendency; (b) interest in international vocation/activities; (c) interest in international news; and (d) having things to communicate to the world (Yashima, 2009). Second, another development is the application of the self-determination theory (SDT) (Deci & Ryan, 2002). The model postulates that humans have “natural, innate, and constructive tendencies to develop an ever more elaborated and unified sense of self” (p. 5). Social contexts interact with this human nature by either nurturing or impeding the organism’s active nature. When the social factors nurture the nature and satisfy the three basic psychological needs, i.e., for competence, relatedness, and autonomy, human beings are proposed to have intrinsic motivation. This is based on the inherent satisfactions and enjoyment of the behaviors. The theory distinguishes between intrinsic motivation and a less internalized type of motivation, extrinsic motivation. Unlike intrinsic motivation, when a learner is extrinsically motivated he/she engages in the activity for “contingent outcomes that are separable from the action per se” (p. 10, original emphasis). Depending on the level of internalization, types of extrinsic motivation are categorized from external regulation (less internalized), introjected regulation (one in the middle), and identified regulation (more internalized). For example, when someone has external regulation, he/she might learn an L2 simply to earn credits. Introjected regulation is more internalized than external regulation in that a learner might study an L2 to avoid guilt or shame. Identified regulation is even more internalized and if a learner has high identified regulation he/she learns an L2 because it is personally important to him/her. In addition to these types of motivation, amotivation represents the lack of intention to act. As such, the theory focuses on the qualities of motivation. SDT has been applied in various L2 contexts (e.g., Hiromori, 2003, 2005; Pae, 2008). For example, Pae (2008) examined the structural relationships among factors affecting L2 achievement, including L2 motivation (motivational intensity, desire to learn English, and attitudes toward learning English), self-confidence, and five L2 orientations (i.e., integrative, instrumental, introjected, identified, and intrinsic). The researcher examined the data from 315 Korean university English learners and tested five models, with each model including one orientation. It was demonstrated that, of the five models, only the one including intrinsic motivation adequately represented the data. In this model, intrinsic motivation led to L2 motivation as well as self-confidence, which both led to L2 achievement as measured by the scores of the Test of English for International Communication (TOEIC). Self-confidence also directly predicted motivation. These results suggest that intrinsic motivation is “the most powerful orientation variable that is related to L2 achievement in the Korean EFL context” (p. 20). Even the internalized type of extrinsic motivation (i.e., identified regulation) did not fit the model, and the applicability of extrinsic motivation in explaining the intensity of motivation and achievement needs to be clarified in future studies. In recent years, variables related to L2 motivation have been extensively researched in particular using SEM, for these variables are believed to be related to one another. These variables include L2 willingness to communicate (WTC) and L2 communication confidence. First, WTC is one’s tendency to approach the initiation of communication when he/she has free choice. The concept has been particularly important in the era when L2 communication in many contexts is considered to be both a means and an end to L2 teaching/learning. Second, MacIntyre (1994) proposed that L2 WTC is predicted by a combination of perceived L2 competence and L2 communication anxiety (apprehension), which make up L2 communication confidence. This means that as a learner has greater perceived communicative competence in an L2 and a lower level of communication anxiety he/she will be willing to communicate in the L2. Past studies have demonstrated the interrelationships among the variables explained above, i.e., L2 motivation, IP, L2 WTC, L2 communication confidence, L2 achievement, and frequency of L2 communication. For example, Yashima, Zenuk-Nishide, and Shimizu (2004) examined the structural relationships among IP, L2 motivation (intensity), L2 communication confidence, L2 WTC, and frequency of L2 communication with a sample of Japanese high school students learning English. In this study the researchers demonstrated that IP significantly predicted L2 motivation as well as L2 WTC, and that L2 motivation led to L2 communication confidence, which then led to L2 WTC. Frequency of communication was predicted by both L2 WTC and IP. However, L2 motivation did not directly predict L2 WTC, contrary to the hypothesized model. What are the relationships between and among the following variables: IP, L2 communication confidence, L2 WTC, L2 motivation, and persistence in self-instruction as measured by the length of study in Japan? Do extrinsic types of motivation significantly contribute to the above SIR model? The participants in this study were 180 Japanese high school students with experience learning English using SIR materials. All were in their second year of high school. To further illustrate, this school, a coeducational high school in Tokyo, is very academically oriented, every year sending more than 50 students to top universities in Japan. Thus, it was expected that they might be generally motivated to learn English. The questionnaire, which was in the participants’ first language, Japanese, was administered during regular class time. Participants were informed of their anonymity, the volunteer nature of the questionnaire, its non-relationship to their grades, and the freedom to drop out of the questionnaire at any time they wished. First, a questionnaire was constructed and piloted with 273 students in the same high school who did not participate in the main study. The questionnaire was analyzed with descriptive statistics, factor analyses, inter-correlations, and answers to an open-ended question that asked the participants to freely write how the questionnaire might be improved. The revised questionnaire consisted of the following three parts: (a) 47 items measuring the subtypes of L2 motivation within the SDT, IP, L2 communication confidence, and L2 WTC; (b) 13 items asking about learners’ experiences using SIR materials (length of study, total minutes of study per week, frequency of study, names of study materials, whether they willingly learned with SIR materials without being coerced by teachers/parents, possible reasons for dropping out, as well as four 5-point Likert-scale items on the quality of learning experience using SIR materials); and (c) basic background questions. Brief descriptions of each variable follow. Motivation-quality. Items measuring subtypes of motivation were based on Noels, Pelletier, Clément, & Vallerand (2000), as well as studies within the framework of SDT conducted in Japan (Hiromori, 2003, 2005; Sakai & Koike, 2008; Tanaka & Hiromori, 2007). Each subcomponent had four 5-point Likert-scale items and asked participants to rate the extent to which the proposed reason for learning English applies to them. Although questions were asked about the five subcomponents, in the present study only the data on intrinsic motivation and identified regulation were included (α = .84 for intrinsic motivation and .90 for identified regulation). Motivation-effort. This study measured effort in terms of how many minutes per week learners put into learning English with SIR materials. In addition, two 5-point Likert-scale questions on the intensity of studying English with SIR materials were asked in order to make the variable as reliable as possible. Specifically, one question asked the participants to rate the extent to which they put effort into learning English with SIR materials (5 = a lot of effort, 1 = little effort), and the other asked them to rate how often they skipped listening to these materials (5 = never skipped listening, 1 = often skipped listening). IP- intergroup approach-avoidance tendency. Based on Yashima (2009), three items measuring the tendency to approach/avoid non-Japanese in Japan. Participants rated their behavioral tendency, recorded on 5-point scales (α = .74). IP- interest in international vocation/activities. Based on Yashima (2009), three items serving to measure participants’ interest in an international career or living overseas, recorded on 5-point scales (α = .83). IP- interest in international news. Based on Yashima (2009), three items focusing on measuring participants’ interest in international affairs, recorded on 5-point scales (α = .76). IP- having things to communicate to the world. Based on Yashima (2009) three items serving to measure the extent to which participants had things to communicate to the world, recorded on 5-point scales (α = .82). Perceived L2 communication competence. Based on MacIntyre and Charos (1996), five 5-point Likert-scale items asked participants to indicate how competent they would feel using English. Items regarded various communication contexts (public speaking, discussion in small groups, and talking in dyads) and interlocutors (strangers, acquaintances, and friends), and they were adapted from Ryan (2009) (α = .91). Communication anxiety in English. Five items asked participants to indicate how nervous they would feel using English. They were recorded on 5-point scales. The contexts and interlocutors were the same as in perceived L2 communication competence (α = .89). L2 WTC. Five items were adapted from Ryan (2009). These items served to measure participants’ willingness to communicate in English. Participants were asked to indicate how much they would choose to communicate in English under various contexts. The contexts and interlocutors were the same as in perceived L2 communication competence (α = .90). Persistence. Persistence was measured in terms of the length of studying English using SIR materials as measured in months. Particular attention was paid to operationalizing this variable. Many students came from junior high schools that are attached to the high school. Some teachers at those junior high schools assigned students to listen to SIR materials. Thus, some participants stated that they only listened to these materials because it was required. In such a case, the total number of months they were in junior high school was subtracted so that the remaining months would represent their true persistence. Quality of Learning Experience with SIR Materials. Four questions asked the participants to rate the extent to which they considered (a) SIR materials to be useful for learning English, (b) the radio to be useful as a medium for learning English, (c) materials to be interesting, and (d) teacher figures of the materials to be of high quality. These questions were asked because their quality of learning experiences with SIR materials was quite likely related to persistence (α = .83). In order to investigate the interrelationships among L2 motivation, IP, L2 communication confidence, L2 WTC, quality of learning experience with SIR materials, and persistence, two hypothesized models were tested using AMOS 18. Figure 1 presents the basic models to be tested, which is based on results of past studies (Pae, 2008; Yashima, 2002; Yashima, Zenuk-Nishide, & Shimizu, 2004). The difference between the two models is whether both intrinsic motivation and identified regulation contribute to the model, or whether only intrinsic motivation significantly contributes to the model. Note: WTC: Willingness to Communicate in L2; CC: L2 Communication Confidence; PC: Perceived Communication Competence in L2; CA: Communication Anxiety in L2; MQ: Motivation (Quality); IM: Intrinsic Motivation; IDR: Identified Regulation; ME: Motivation (Effort); ER: Effort Reported; NSL: Non-Skipping of Lessons; MIN: Total Minutes of Study Per Week; QLE: Quality of Learning Experience with SIR Materials; IP: International Posture; IIN: Interest in International News; AAT: Intergroup Approach-Avoidance Tendency; IVA: Interest in International Vocation/Activities; HTC: Having Things to Communicate to the World. As a preliminary screening, four participants who answered that they used English for communicating with their families were deleted, for this was not typically Japanese. Then the patterns in missing data among the 47 Likert-scale questions (less than .5% of all possible answers) were checked. Since there did not seem to be any noticeable patterns in the missing data and no participant had more than four answers out of the 47 items missing, those missing answers were replaced with the means of the individual responses for each variable. After replacing the missing answers for the 47 Likert-scale questions with the individual means for those scales, nine participants had missing answers on the remaining variables and there were complete data for 167 participants. This analysis used only complete cases (n = 167). For all the variables except for the ones stated below, the means of the answers to the questions on each variable represented observed variables in the SEM analysis: persistence, efforts reported, non-skipping of lessons, and total minutes of study per week. This was done in order to reduce the number of variables in the SEM analysis and reduce the size of the models, particularly in light of the relatively small number of participants in the analysis. The assumptions for the analysis were checked through SPSS. Five cases, either as univariate or multivariate outliers, were deleted from the data set (n = 162). No non-linearity or multicollinearity was detected. Maximum likelihood was chosen as the estimation method. First, for both of the models, the results showed large χ² values, 167.31 with df = 70, p < .01, for Model 1 (with intrinsic motivation and identified regulation, see Figure 1), and 150.51 with df = 59, p < .01, for Model 2 (with only intrinsic motivation, see Figure 1). Although the two models were both statistically significant and showed poor fit to the data, given the known sensitivity of this statistic to sample size (Byrne, 2010, p. 76), other goodness-of-fit indices were examined. Table 1 shows the goodness-of-fit indices of the two models. Model 1, which contains both intrinsic motivation and identified regulation as components of L2 motivation-quality, showed a slightly better fit to the data, as evidenced by higher CFI and lower RMSEA . Thus, the data with Model 1 was closely analyzed. Figure 2 presents the initial model with its standardized estimates. Because the model fit was still poor ways of improving the model were explored. It was suggested that if a path was drawn from IP to L2 communication confidence, the overall χ² value would drop by at least 44.66 with df = 1, which is significant at p < .01. This means that those who have high IP scores are likely to have confidence in L2 communication. This requires further research, but considering that using SIR materials is only one way of learning an L2, and many of those who are high in IP may have other ways of learning an L2 which are not represented in this model, it makes sense that they are likely to be confident in L2 communication confidence. Thus, this data-driven path from IP to L2 communication confidence was added to the model. Although space does not allow for detailed discussion of the full model, some points should be emphasized. First, in comparing the two models, not only was intrinsic motivation a significant variable in the final model, but an internalized type of extrinsic motivation (identified regulation) was as well. Second, the IP and L2 WTC models were partially replicated in this study. The paths from IP to L2 motivation-quality and from L2 communication confidence to L2 WTC were both significant, but not from IP to L2 motivation-effort or from L2 motivation-quality to L2 motivation-effort. Regarding the relationships among IP, L2 communication confidence, and L2 WTC, IP did not directly predict L2 WTC, but rather predicted L2 communication confidence, which in turn predicted L2 WTC. Third and more importantly, persistence in learning with SIR materials was predicted by quality of SIR learning experience and motivation-effort, but not by L2 motivation-quality. Quality of SIR learning experience also predicted L2 motivation-effort. L2 motivation-quality did not predict persistence or L2 motivation-effort. Finally, persistence did not predict L2 communication confidence. These results indicate that L2 motivation-effort and quality of SIR learning experience were significant factors for predicting persistence, but not L2 motivation-quality. Participants’ learning experiences with SIR materials might be a particularly important factor in predicting persistence because it also predicted L2 motivation-effort. Furthermore, even if learners study English for a long time with SIR materials, they might not be confident in L2 communication. This might be because learning with these materials does not offer opportunities for interaction. Persistent learners may or may not have other ways of practicing L2 communication; without these opportunities, they may not be confident in L2 communication, even after persisting in this type of learning for a long time. As demonstrated in the final model, those who were likely to persist in learning with SIR materials were those who put forth much effort and had positive experiences. The next step in future research might be to examine the actual L2 learning in self-instruction among those who do persist. Also related to the issue of actual learning, in future research it will be fruitful to examine the effect of the lack of interaction in self-instruction. Contrary to the general agreement in the L2 literature that interaction is essential for L2 learning (e.g., Long, 1996), L2 self-instruction, especially using radio materials, does not allow such interaction. Thus, future studies should examine what kind of role self-instruction plays in L2 learning. Pedagogically speaking in order to help L2 learners persist in self-instruction materials designers need to explain what it is like to study with SIR materials at the beginning of each new series. Teachers and parents could also play a role in helping young learners study with radio, a medium that young people might not be used to. Quality of SIR learning experience is an important factor in persistence, and even if learners are motivated to learn English, if their experience learning with SIR materials is negative they are not likely to persist in learning. Furthermore, persistence in learning with SIR materials did not make L2 learners confident in L2 communication. This might mean that L2 learners using SIR materials need to consider ways of compensating for the lack of interaction in this type of learning so that they can be confident and comfortable with L2 communication after learning with SIR materials. Considering the advantages of SIR materials, self-instruction using radio materials can be a valuable way of L2 learning. Learning to make the most of these materials and finding ways of compensating for the lack of interaction for themselves might help these learners become more self-directed. Chika Takahashi is an assistant professor in the Faculty of Law and Letters at Ehime University. Her research interests include L2 motivation, L2 self-instruction, and research methods. This study was partially supported by the Language Learning doctoral dissertation grant. Byrne, B. M. (2010). Structural equation modeling with AMOS: Basic concepts, applications, and programming (2nd ed.). New York, NY: Routledge. Deci, E. L., & Ryan, R. M. (Eds.). (2002). Handbook of self-determination research. Rochester, NY: University of Rochester. Gardner, R. C. (1985). Social psychology and second language learning: The role of attitudes and motivation. London, UK: Edward Arnold. Long, M. H. (1996). The role of the linguistic environment in second language acquisition. In W. Ritchie & T. Bhatia (Eds. ), Handbook of second language acquisition (pp. 487-535). Malden, MA: Blackwell. Ryan, S. (2009). Self and identity in L2 motivation in Japan: The ideal L2 self and Japanese learners of English. In Z. Dörnyei & E. Ushioda (Eds. ), Motivation, language identity and the L2 self (pp. 120-143). Clevedon, UK: Multilingual Matters. Yashima, T. (2009). International posture and the ideal L2 self in the Japanese EFL context. In Z. Dörnyei & E. Ushioda (Eds. ), Motivation, language identity and the L2 self (pp. 144-163). Clevedon, UK: Multilingual Matters.